I know it is early, but if I don't do this now, it will not happen. We are gaining on the unpacking and settling in. The guys got the porch floor back down, the grass is growing, the garden is looking lovely... now, if I could just move a little faster between the houses and get DONE with all these boxes. They are so over rated!! With it being father's day weekend, I am going to take a break from that work and do some more. We are having our first family gathering since we moved in. I'm hoping that dad will feel up to eating, as he has his first treatment tomorrow and we have no clue what to expect. For my prayer warriors, please keep him in your prayers. The chemo didn't do what we had hoped and prayed it would do. As far as we know the cancer has not spread but the spot they were concerned with has grown and so he has opted for this new antibody treatment. It is so hard to watch him go through all of this and know how uncomfortable he is. Hopefully the first dose won't be too bad and he will be able to enjoy the day a little bit. Just in case, I'm going to make him a batch of peanut butter fudge. That will make him feel much better. :) I hope I remember to take pictures. It seems I always have a spoon or a bowl in my hand and then we get no pictures. They are so important, especially now. I know that the scrapped photos won't give you a great look, but I'm sharing a bit of the new place with all of you. The quick page was created by Jemima using my Wishing for Summer kit. It was free last month for the QP challenge and there are so many adorable things created with it. I chose this one because it allowed me to use multiple photos. The lake is not ours, but we are fortunate enough to be able to enjoy it. I hope that you will all have a great weekend and can spend time with your father or your family. I'm so blessed to be able to spend time with mine and doubly blessed to be able to spoil my daddy on his special day. Hug your family and let them know how special they are to you. We are not promised tomorrow and need to make the most of every minute we have together. Now, for those of you who remember to take camera in hand and have a special guy in your life, take the photo and create a layout about how/why he is so special to you. Then go to the Ivy Scraps Forum and share it in there and in the gallery. You can get this awesome kit free from LilyBelle Designs, just for sharing it there. Just shoot me and be done with it. I have always been one to go through my clothing at the end of each season and take what hasn't been used to a charity that will put them to good use. This move has shown me that I need to do that with everything I own!! It is AMAZING what you can collect in 30 years time and you can believe that won't happen in the next however many I have left on this earth. Now, other than all of the boxes and trying to sort out what to put where we are enjoying the new home. The garden is looking pretty good after all of the rain last weekend. I can't wait until there are things to take from the garden to the table. Yummy!! We have had so many things going on lately that my good intentions are not going so well. In all of the chaos, I haven't been on here in a month boo hiss!! In my defense, moving is a lot of work. Well, it was worth a shot. Seriously though, we have been very blessed to have wonderful people in our lives to make the moving and transition go well. A couple more weeks and I will be able to sit in the chair with a tall iced tea and my feet up or maybe sneak out to Green Acres and visit our friends there. WOO HOO!! Whatever it is will probably need to be outside because the dogs think that they should be out there every second of the day. Icarus is doing much better with fewer steps to be climbing and the addition of MSM to his supplements has him walking around a little better. Abby gets around okay but would rather guard the porch and her rawhide chew. 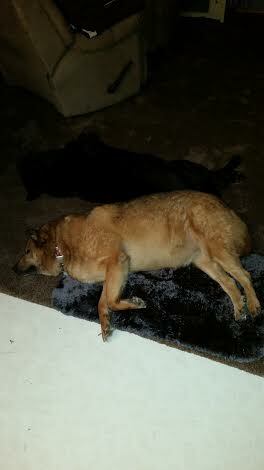 Check out how they deal with all the chaos from moving. Friends, I have a request for those of you who are prayer warriors. I'm asking for an unspoken prayer request. The power of prayer is awesome and those prayers have gotten us through so much the last year or so. I know that they will make a big difference and am asking you to continue sending prayers and healing thoughts. Thank you so much for doing so and I will update when I can do so. Until I get back here to post again, be sure to visit the forum at Ivy Scraps and check out the challenges for this month. You will want to check out the June mini pixel kits too. The theme this month is June Weddings and there are some awesome kits to scrap your wedding photos and many other events. The cost of each mini kit is just $1, so the price is right! Well, maybe you are but you will never admit it! After living in the same home for 33 years, it is time for a change and for me a big one. Over the past year there have been so many changes in our lives, both good and bad, that it is hard to even think straight. There have been some bumps and sad days along the way, but for the most part they are good changes and we are looking forward to starting another chapter in life. In just a little over a week things will transfer from one home to another and the holiday weekend is going to be a very busy one for all of us. Green Acres opened a month ago and we haven't even thought about getting out there yet! I think it is going to be another summer to blink and ask where the time has gone. In May we have already celebrated 2 weddings and little Braelynn's birthday. She is the sweetest little thing. Well, she is a little ornery, but we like her that way. And check out the number 1 big brother! He sure was the life of his Ma's wedding! We were blessed that dad felt up to all the celebrating, and if he didn't he was a good sport and didn't complain too much about any of the fuss. If that isn't enough to smile about, the garden is starting to show signs of life and I can almost taste all the things that I've been craving all winter long. Be sure to stop by the forum at Ivy Scraps and check out the challenges this month!! Hugs to you all. Come Celebrate NSD and Each Day with Gloria! 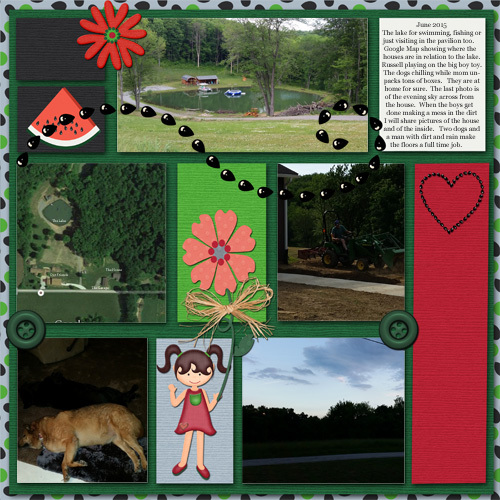 Gloria and I have been friends through digital scrapbooking for several years. Many of you will know her from Moo Two and Ivy Scraps. For those who do know her, they will know how giving and how special she is. If you don't know her, then you are missing out on a very special friendship! Gloria and I now work together at Ivy Scraps and over the past months and years, she has created many lovely gifts for you that go into the newsletter or into the forum. Once a month or bi-monthly she creates a kit in honor of one of our design, CT or membership family. We are not talking Mini kits here. We all know that Gloria is from Texas and they do everything BIG there! Her kits are no exception and into each one goes a lot of thought about the person she is shining the spotlight on that month. Gloria's heart is as big as the state of Texas and the design team at Ivy Scraps decided it was time to give some of that love right back to her. She loves her family, especially those grandchildren!! 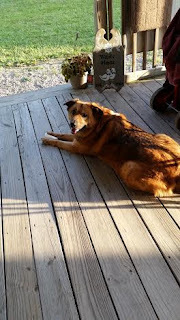 She loves to take road trips, to design, to read, helping others and giving to those who need her. I'll be some of you know she LOVES to bake cupcakes. Once at Ivy Scraps her avatar was the cupcake lady!! 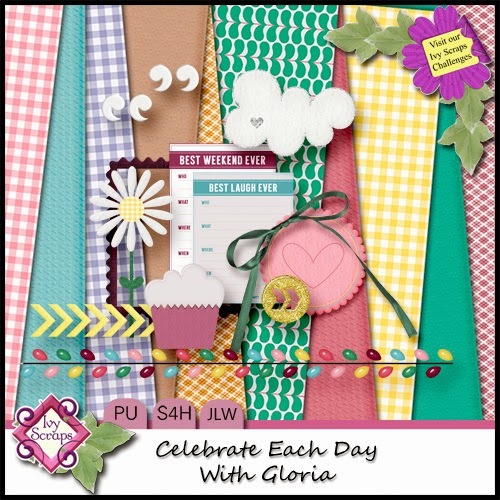 So, Gloria, in honor of all that you love and all that you do and in return for all of the love that pours from your heart to the Ivy Scraps family, we hope you will be able to use this kit as you celebrate the special days and special things in your life. Thank you for being such an awesome friend and inspiration to us all! To the rest of you, follow the blog train and pick up the pieces of the kit Celebrate Each Day with Gloria! It has been a while since I've used this blog, and I truly am the world's worst blogger!! By the time I sit down at night, I am in nap mode! Perhaps my age is catching up with me. Whatever the cause, I am posting today so that you will know to check back on the weekend for a gift from me in honor of National Scrapbooking Day. We will celebrate a little longer than a day and I hope that you will enjoy what I made for you. Until then, maybe you would like to come and play in the forum at Ivy Scraps and pick up this kit for FREE! It was created for the quick page challenge in May and will be available in the Ivy Scraps store in the following month. So, if you have time to play come and join us for a fun time and lots of lovely quick pages that will make a nice little album at the end of the month. If there is no time to play, hop over to the store in June and pick up the kit to work with at your leisure. If you are not a member at Ivy Scraps yet, join the forum and you will receive the links to download this Welcome Kit that the design team has created for you. Although I have stopped using the Waite for the Moment Designs name, you can still find me at Ivy Scraps and I still design a bit here and there. When I took over the ship, so to speak, I decided to just put my things under Ivy Scraps rather than have 2 business licenses and more tax returns at the end of the year. I'll be closing down the other blog and sharing with you here, once again. I can't wait to share all the fun things going on in life, but it will be slow in the writing. Hugs to all!